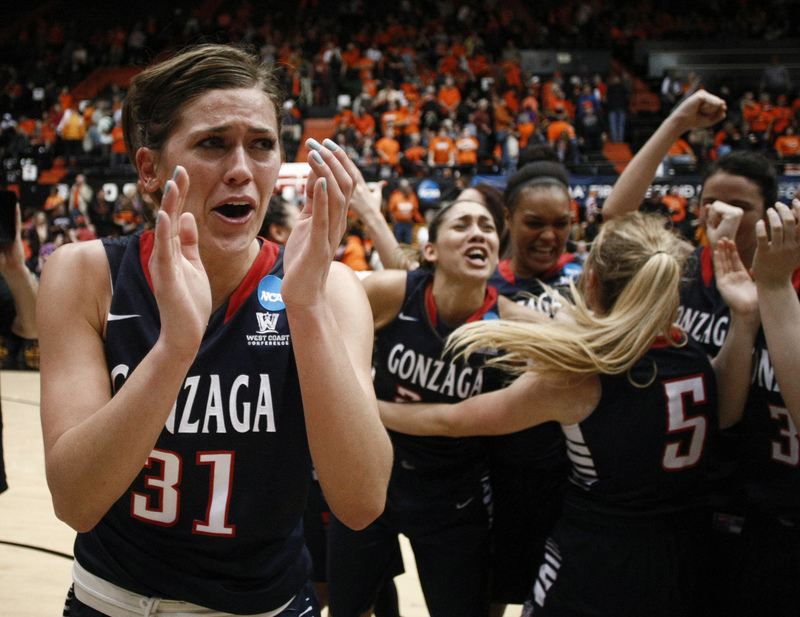 UPDATED: Sun., March 22, 2015, 9:17 p.m.
CORVALLIS, Ore. – Gonzaga pulled off its biggest upset of the year on basketball’s biggest stage Sunday and the Bulldogs are now dancing home to Spokane to play in the Sweet 16. Facing Ruth Hamblin, Oregon State’s dominating center from Canada, the No. 11 seed Bulldogs turned to their own Canadian post player, Emma Wolfram, who scored a career-high 17 points and led Gonzaga to a 76-64 victory over the third-seeded Beavers and earn the chance to play in front of its own fans. Gonzaga (26-7), which has won more NCAA tournament games as a double-digit seed than any team in history, upset No. 6 seed George Washington 82-69 on Friday to advance to play the host Beavers (27-5), who won the Pac-12 regular-season championship. With OSU’s home crowd roaring in opposition, the Zags fell behind early, rallied and led by as many as 12 points in the second half until Oregon State staged a furious rally. Oregon State’s Jamie Weisner, of Clarkston, completed the comeback when she hit a 3-pointer with 3:32 remaining to tie the game at 64. But senior forward Sunny Greinacher, who also hit the game-winner at the same point in the game on Friday, calmly nailed a jumper with 3:09 to play that started a 12-0 Gonzaga to end the game. A few plays later, senior guard Keani Albanez dribbled and made a desperation drive toward the rim. Her layup went in at the shot-clock buzzer to put Gonzaga up 68-64 with 1:24 to play. The referees reviewed the shot and it stood. Rueck said he really wanted to thank the selection committee for sending Gonzaga as an 11 seed to Corvallis, especially after Gonzaga shot 50 percent from the field in the win. Gonzaga will play Saturday in the Spokane Arena against the winner of tonight’s game between No. 2 seed Tennessee and No. 10 seed Pittsburgh. Gonzaga was also a No. 11 seed in 2011 when it played in Spokane and advanced to the Elite Eight before falling to Stanford. But Gonzaga’s current dance would have ended without a monster performance from Wolfram, a redshirt freshman. Hamblin, a 6-foot-6 center and reigning Pac-12 player of the year, was limited to only four rebounds and nine points. Weisner almost carried her Beavers to the victory with her game-high 24 points. But the Bulldogs got several defensive stops and Oregon State could not get another shot to fall. Deven Hunter scored 12 points and had 10 rebounds and senior Ali Gibson added 10 points for the Beavers, who shot 41.2 percent. Four Bulldogs scored in double figures. Elle Tinkle scored 14 points and grabbed a team-high seven rebounds. Greinacher and Albanez both scored 12 and Georgia Stirton seven. Wolfram didn’t score her first point until the 10:55-minute mark of the first half. She ended up scoring 10 points before halftime, which ended with Gonzaga leading 37-34. With the No. 2 seed Gonzaga men beating No. 7 seed Iowa in Seattle, Tinkle said Sunday was a great day to be a Zag. Published: March 22, 2015, 6:10 p.m. Updated: March 22, 2015, 9:17 p.m.